Luere Babson Deasy was born 8 February 1859 at Gouldsboro, Maine, the son of sea captain and Prospect Harbor merchant Daniel Deasy and his wife Emma (Moore) Deasy. 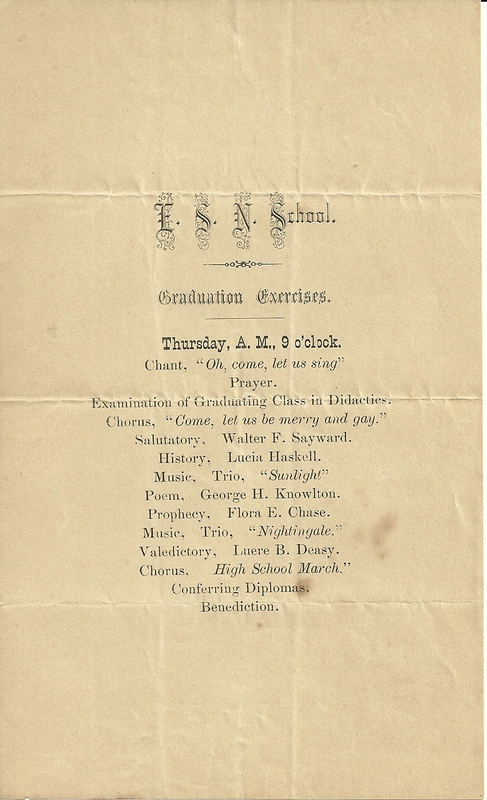 He graduated as Valedictorian of the Class of 1881 at Eastern State Normal School and subsequently entered the Boston University School of Law. He set up his law practice in Bar Harbor in 1884, quickly gained a favorable reputation and served two terms in the Maine Senate before being appointed to the Maine Supreme Judicial Court. He was a well-known citizen and benefactor in the Frenchman Bay area. 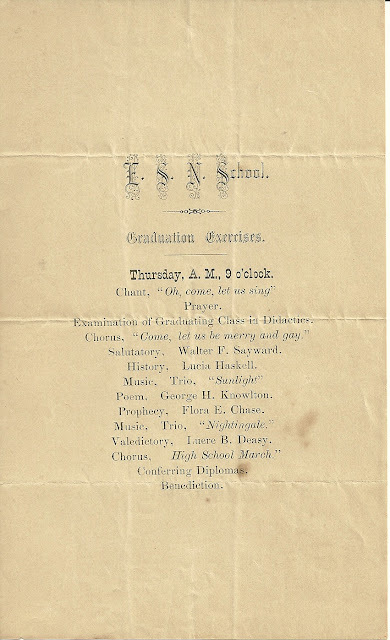 An earlier post shows scans of the pages of the Eastern State Normal School catalog ending June 3, 1881, in which names and home towns of trustees, faculty and students are listed. Luere Babson Deasy's father, Daniel Deasy, according to his death record in 1922, was born in Quebec about 1834, but I have yet to find anything more about his origin. I know that he was a sea captain who settled at the Gouldsboro village of Prospect Harbor and was half of the partnership of Deasy and Handy, which operated a mercantile business there from 1868 to 1888. The University of Maine's Fogler Library has an archive of Deasy and Handy papers. The house built by Daniel Deasy in 1847 is now being operated as a Bed and Breakfast known as the Mermaid's Purse Farm. It's interesting to note that Luere Babson Deasy's wife was Emma M. Handy. Perhaps her father, Joseph Chipman Ward Handy, was Daniel's partner in Deasy & Handy. Luere Babson Deasy's maternal grandparents were David and Lois (Louisa) C. (Cole) Moore of Prospect Harbor. Shortly after setting up his practice in Bar Harbor, in 1885 Luere Babson Deasy married Emma M. (Handy) Clark, widow of Stephen Clark. Stephen Clark was lost at sea while mate on the bark Teekalet, which had left New York bound for L'Orient in the fall of 1878. The 717-ton Teekalet was built at Milbridge, Maine in 1875. Emma M. (Handy) Deasy was born 25 August 1853 at Prospect Harbor, the daughter of Joseph Chipman Ward Handy and wife Mehitable (Cole) Handy. Her paternal grandparents were William and Abigail (Noonan) Handy. Her maternal grandparents were Abijah and Rebecca (Simonton) Cole. Inez Louise Deasy, born 1 January 1895 at Bar Harbor, Maine; married Frank Gray, Jr.